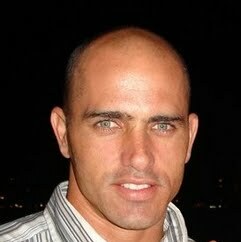 Robert Kelly Slater is an American professional surfer known for his competitive prowess and style. He has been crowned ASP World Tour Champion a record 11 times, including 5 consecutive titles in 1994–98. He is the youngest and the oldest to win the title. Upon winning his 5th world title in 1997, Slater passed Australian surfer Mark Richards to become the most successful champion in the history of the sport. In 2007 he also became the all-time leader in career event wins by winning the Boost Mobile Pro event at Lower Trestles near San Clemente, California. The previous record was held by Slater's childhood hero, three-time world champion Tom Curren. After earlier being awarded the title prematurely as a result of a miscalculation by the Association of Surfing Professionals, on November 6, 2011 Slater officially won his eleventh ASP world title at the Rip Curl Pro Search San Francisco, by winning his 4th round heat. In May 2005, in the final heat of the Billabong Tahiti Pro contest at Teahupo'o, Slater became the first surfer ever to be awarded two perfect scores for a total 20 out of 20 points under the ASP two-wave scoring system.